Matt Crafton, driver of the No. 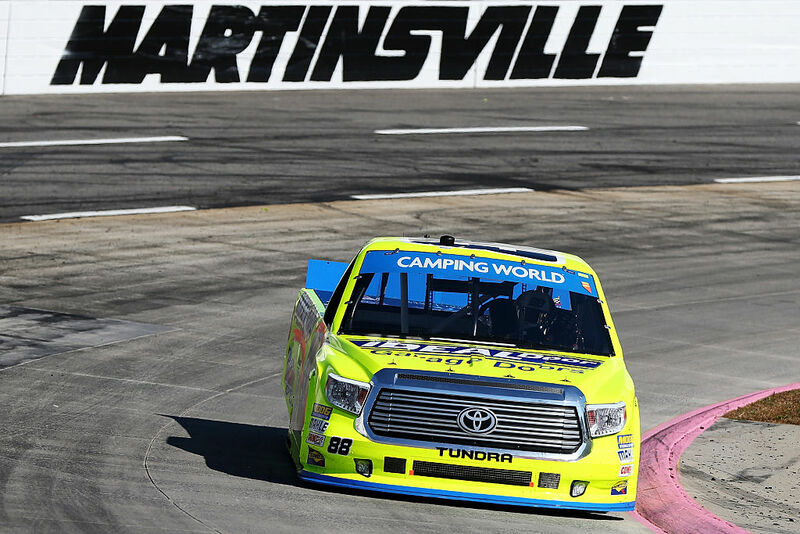 88 Ideal Door/Menards Toyota Toyota, made his 30th career start at Martinsville Speedway in Saturday’s NASCAR Camping World Truck Series (NCWTS) Texas Roadhouse 200 presented by Alpha Energy Solutions. Starting 11th, Crafton fought a “free-in, and free-off” Menards Toyota Tundra, and brake issues throughout the 200-lap event. With experience at a premium at the tough half-mile paperclip, Crafton was able to work his way inside the top-10 by lap 10, and the top-five by lap 70. With 50 laps to go, Crafton, who was running eighth, radioed into crew chief Carl “Junior” Joiner that he had no brakes and the left rear was on fire.” The ThorSport Racing driver brought his Menards Toyota Tundra to pit road twice under the lap 150 caution for four tires, fuel, and to go under the hood to repair a brake caliper. The two-time champion restarted 22nd, one lap down to the race leaders, and in the final 45 laps was able to work his way back onto the lead lap, and finished 17th behind race winner, Johnny Sauter. Crafton, one of six NCWTS drivers to make Round 2 of the inaugural NCWTS Chase, is currently ranked fifth in the championship standings. Two more races remain in the semifinals of the NCWTS Chase. The top four drivers from Round 2 will advance to the final Round, which kicks off at Homestead-Miami Speedway, the final race of the season. When did you start feeling you had a brake problem? How strong was your truck before the brake issue? What did it mean to salvage a finish on the lead lap after the problem? The NASCAR Camping World Truck Series (NCWTS) had two practice sessions on Friday afternoon in preparation for Saturday’s Texas Roadhouse 200 presented by Alpha Energy Solutions at Martinsville Speedway. Matt Crafton was fourth, and 12th, respectively, in both sessions. Making his 30th career start at Martinsville Speedway, Crafton started eighth, ran as high as fourth, and finished 17th, due to brake problems late in the 200-lap race. In 30 starts at Martinsville Speedway, Crafton has led 279 laps en route to two wins, eight top-five, and 17 top-10 finishes. In 20 starts in 2016, Crafton has one pole (Atlanta), two wins, and has led 421 laps en route to six top-five, and 13 top-10 finishes. In 381 career NCWTS starts, Crafton has earned 12 poles, led 2110 laps en route to 13 wins, 95 top-five and 223 top-10 finishes. Crafton’s ThorSport Racing teammates finished 11th (Hayley), 19th (Rhodes), and 24th (Abreu). Up Next: The Longhorn 350 at Texas Motor Speedway on Friday, November 4, 2016.